Kidderminster grew mainly as a carpet manufacturing town when Brintons Carpets began in 1785 and other carpet companies then followed it into the town, until by 1951 there were 30.. Today Brintons is still operating as are others notably Victoria Carpets and both are world renowned. The town has a thriving shopping centre with most large national retailers having a presence. Running north to south through the centre of the urban area but tangentially to the west of the main shopping and hence visitor area, the canal appears to be incidental to the town as this important resource has not really been developed to its full potential for visitors. A non too successful canal festival was held in 2010 and 2011 but I haven’t heard or seen anything of such an event since. The 4 mile stretch of the canal down to Stourport soon loses sight of the built up area and appears to be running through natural countryside though in fact suburban housing is never far away. 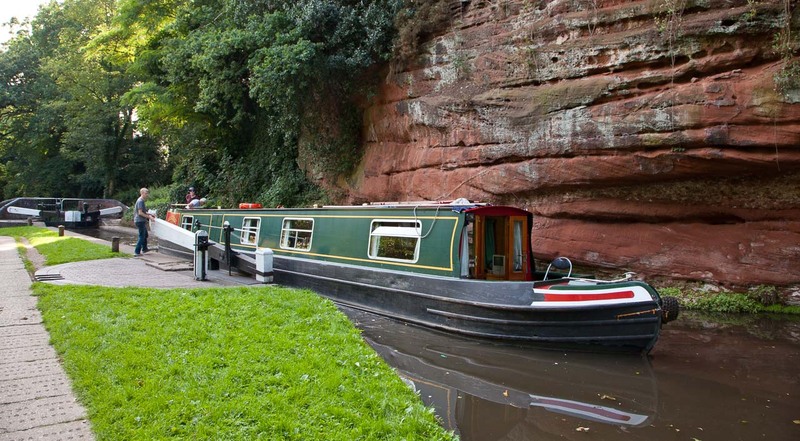 As a result, to the canal visitor, the route is pleasingly attractive with a number of interesting and historic features. Of particular note is the exposed sandstone ridge at Caldwell lock and the majestic rail viaduct at Falling Sands. The approach to the basins in Stourport and thence to the River Severn has been developed recently and is an attractive place to live if you are lucky enough to have one of the new canal side dwellings. Stourport-on-Severn itself is to be covered in an article of its own. That was a nice introduction with a family out enjoying a walk along with their child in its pushchair along the towpath, just coming up to two moored boats. Your shot of the Caldwall Mill Bridge  [although you have renamed Cawmill Bridge is full of interest. The archway looks as if at sometime it had to have an extra supportive archway added and some not so sympathetic repairs made topside. I liked the way you captured the reflections in the water and I did note the two gardeners working away. The Watermill Pub looks very inviting, which the boat owner cruising by would no doubt agree. I found that sandstone ridge very imposing even though you made it blend in with the trees and boats. Almost lost for words to describe that dramatic picture with the backdrop being the magnificent rail viaduct as it looks down on its past industrial competitor – the canal system. Once again lots of people and animals around and even those without held a certain fascination, as water always seems to attract. Thanks Geoff, enjoyed them all.